So a friend of mine posted a request in this Disney lovers group I belong too. She said, I have a friend (in another group) that would like matching t-shirts to go to DisneyWorld. She was looking for anyone who knew how to do iron ons or appliques, to wear in WDW. She and her husband (who is flying in from Afghanistan) are surprising the kids. 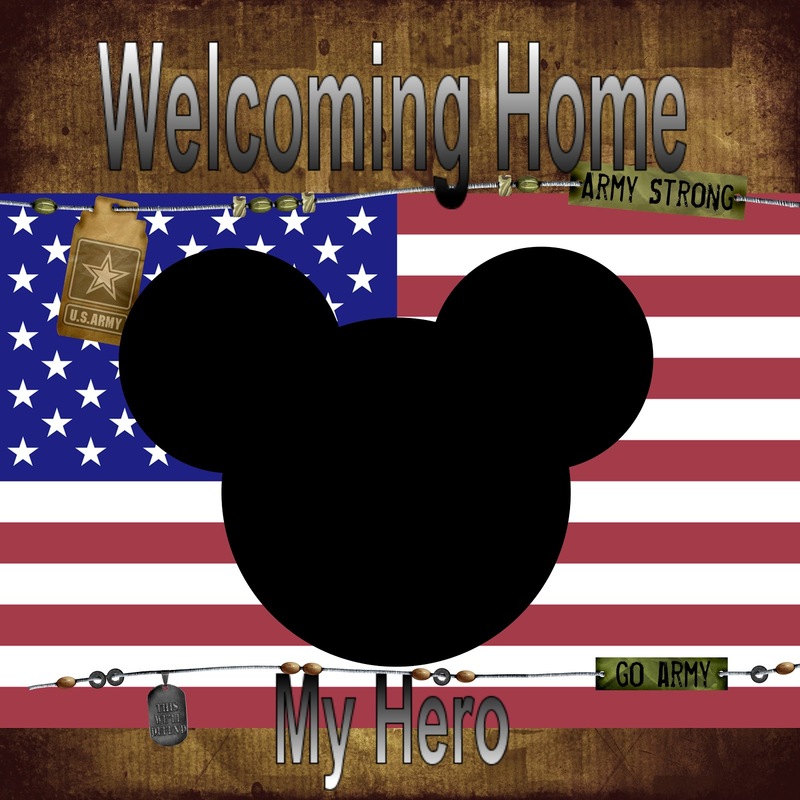 He's been deployed a year, and is meeting them there. Anyway, when I heard the story, I couldn't help but think of the people I know trying to cope while husbands are/were deployed. I knew I could help this lady. Well, that was before the Bedrest. But I still wanted to help her. So last week before Thanksgiving, I contacted this gal, and we started chatting back and forth, so I could get some ideas of what she wanted. 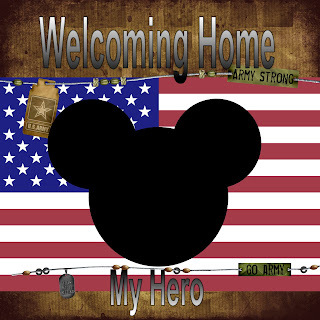 Then I designed it, with my digital scrapbooking software. She and the 4 kids will get this picture on a shirt, and for the husband, he's getting a manly version with no words. ;) Army men never call themselves heroes. But they are my Heroes! However, my last hurrah this week was going to Hobby Lobby. Not that I blame a shopping trip to Hobby Lobby as putting me on bedrest, I don't. It was just one of those things, a sign I was doing too much. So I bought the shirts. And then I realized I was going to need some extra special Helpers to help me finish the projects. I called upon my bestie Kathleen, who is as much a Disney nut and as Patriotic as I am. She was up for helping. So Thursday when we had no kids, she came over and ironed on while I "directed". We ran into a few technical difficulties, one of the shirts we got, someone else had ironed on, left invisible residue, and must've returned it, so that when we ironed on our picture the word "Girl" and a tiny flower popped up in the middle of our picture. So she had to run back to Hobby Lobby for another shirt. Hobby Lobby did not accept her story or the shirt. Uncool Hobby Lobby, very uncool. But Kathleen is a Superchamp, and she followed through with her Elven duties, and bought another shirt amongst other supplies. And she didn't kill anybody. I was very proud of her. Can't say I would've behaved as well in the same position. But the Spirit and Good Deed Doing gives us Strength. So tonight, as the yahoos were going to bed, she came by and we finished our Mission. We ironed on the shirts, finished them all up, and they looked really good, and they will be going to the Post Office and on to Maine tomorrow morning! Mission: Mickey Good Deed Doing Accomplished! This week has gotten way out of whack with me being out of commission. But I received a beautiful Blessing from Christopher yesterday. He hadn't gotten a flush Wednesday, so he needed to get up early for one yesterday. When he got home then, he didn't need one. So he just came into the living room, where I was camped out a lump on the couch. He unpacked his snack and started telling me about his day. While he was eating his sandwich, I was starting a new craft, so I wasn't watching tv, but he picked up one of the christmas books on the coffee table and started reading. I thought it was a Beautiful sight, that he would just pick up The Christmas Story and read about the birth of Jesus while having half a peanut butter sandwich. One moment of Beautiful Almost Normalcy. Tuesday I overdid it. I was feeling good, getting in the holiday spirit, and I let Sam stay late at school. I was planning on doing brunch with Mom W. and running her to the hospital for a couple of appointments. But before we ate, I was just dying to stop at Hobby Lobby. I bought some shirts and some yarn, we ate, and went over to the hospital. And while there, I started spotting. I wasn't too worried, I wasn't crampy. The blood was most likely the stuff they'd seen on the ultrasound the week before, not fresh from a ripped placenta. So Eric and I talked about it, and since I felt good, we stayed home. I tried to take it easy, but I was too tempted by the holiday spirit again to decorate the trees. So I helped a bit, absolutely minimally, I swear, my body was doing a fine job of telling me when was too much. By Wednesday, I figured we were Good. The only thing on the docket was taking Sam to gymnastics, but by about 11, I started feeling crappy. I hadn't done much at all actually, just got the boys dressed, and picked up a few things around the house. I called a friend and she took Sam to class. I called my doctor, and spoke with my nurse. I think that just doing a little bit around the house was wearing me out too much. She and I agreed that until I'm healed, I should probably just be on Modified Bedrest. And by that I mean, I can sit, I lay down. Minimal trips down the stairs. I can drive and passenge, but I can not do much when I get there. Mom W. and I had been joking about getting a wheelchair. Looks like I'm going to be really Needing it now. I'm too tempted to do stuff on my own, then quickly regret it. My contracty cramps were getting painful. That afternoon, they were so bad, I couldn't sleep. That's a bad sign to me. Usually if I lay down in the dark and the quiet, I can sleep, and the contractions would stop. They didn't. I needed them too. The fact that I couldn't sleep worried me more, and probably made me not sleep more. At 17 weeks, no good can come of lots of contractions. Then I got to crying, and I went ahead and put a call back in to the nurse and to Eric. He got home before they called me back, but I figured they'd want to see me if the cramps were preventing sleep. I drank a boatload of water, and they called saying come on up north. We dropped the boys off at Kathleen's, they were thrilled and north we went. They took me up to Labor and Delivery and examined me, hooked me up to a few things. My blood pressure was high for me 137/80, I'm like a 110-120 gal. But I figure I was worried and in pain, those things don't work well for BP. But it calmed down. It was also a bit of a hoof up to their floor, perhaps I should roll next time, not walk it. 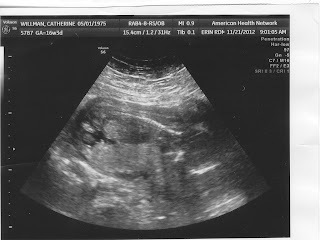 They drew some blood, took an ultrasound, and the baby and I were Fine. But I was a little bloody, not fresh, and they checked the tear, which was still in existence, not gone. The doctor told me to go home, REST! (For real this time!) and that "tomorrow" they would send me to see High Risk/Maternal Fetal Medicine. The Pros. OK. I liked that plan. They'll figure out what's going on with El Bebe and I. They haven't called with my appointment yet, but since I'm sitting and laying down a lot today, I plan on stalking them until I have an appointment. Meanwhile, the world is a much better and calmer place when I get to see a healthy wiggly baby with a strong heartbeat (160). We went home in a much happier place. Frankly, I was very comforted by the wonderful staff, who told me that though I felt like I was catastrophizing, I'm not, that THAT is Exactly why they are there. 24/7! the nurse kept telling me. They even fed me snacks (which Hendricks did not). They are so nice up there! Worth the drive! We swung by Kathleen's and it was good to just sit and get loved on by girls and boys. I hadn't seen the girls in a while, and they'd had a great evening playing with the boys, but the twins couldn't stop chattering at me. It felt good to be so loved. And Baby #3 is Just Fine. My primary Job has gone from Stay-at-home Mom rarely at home, to Stay at Home Mom, Baking a Baby. So we're just going to be Resting for a while. A Top 10 of Festive Decoration. 1. This year is a nifty year, we have a total of 3 trees (I know crazy) and one we designated as the Disney Tree. So Christopher was thrilled to put his My First Christmas Winnie the Pooh ornament on that tree first. 2. Chris puts up a star ornament he made in MOPS before Sam was born. 3. Sam puts on his own ornaments. 5. I watch happily as my boys all decorate. I had overdone it a bit on Tuesday, and by evening, I only had energy to wrap one tree in tinsel garland I was done, I had to sit. 6. Cookie and Oscar! My sister and I had this set of Sesame street ornaments when we were little, and I mean LONG AGO, when my parents were married. To Each Other. We got the set, and though they have seen better days, the kids and I still love pulling them out every year. This year, Chris pretended he was Cookie, and he was going to eat Oscar and every other ornament and cookie he could find. His Cookie Monster impression was Spot On. 7. Sam's first ornament. My friend Cathy C. knit this itty bitty hat for me when I was pregnant with Sam. It was his first Christmas ornament, before he even got here. It may have fit him at the time, as he was the size of a tomato at the time, but not anymore. 8. Jingle Bell, Jingle Bell, Jingle Bells Rock! That's what they were singing as they decorated. Then they started running around the house singing, and less decorating was happening, it was time for bed. Thanks to Christopher for taking this picture of me. In spite of looking like a hot mess, he always gets the best smiles from me, probably because I love him so. It does my heart good to see him with a camera. He's my favorite photographer. Since I haven't been feeling well, I haven't been taking many pictures. The only one I took on Monday was a recipe that was calling to me from a magazine my friend was reading at the library. I'm not even sure which one it was, but I saw the picture upside down, and started drooling. I wish I had the energy to actually cook. I get great ideas, I have all kinds of lofty holiday cooking goals, but by the time I merely toast a bagel I'm done. But these call to me. Given my "delicate condition" we had a decision to make on Sunday morning. One of the things I had really wanted to do over our Thanksgiving Vacation was to take the boys to see the new Disney movie Wreck-it Ralph. We tried to go Saturday morning, but we got there a just in time for start, and it was all sold out. So we had to turn around. Chris had a monster meltdown all the way out of the theatre, all the way home. It was ugly. We all went home and went straight to bed. I thought we'd not be able to go back. But later that evening we tossed around the idea of going again Sunday morning. The thing was that tickets are cheap if you go before noon, 5$ a piece, it goes Up after that. But there was no way I was going to have the stamina to go to church, AND go to the movie. So we decided, since there was no sunday school because of the holiday weekend anyway, we'd skip church, and go to the movies. Ah, to focus on the Blessing of Time spent Together. So we made it to the theatre at 10, bought the tickets, and then went to Panera for brunch. We hadn't gone out for breakfast all 4 of us in Ages. It was wonderful. The boys were in great moods, giggling laughing. And the staff messed up our order giving us an extra bagel AND an extra sandwich, which ended up being Sam's favorite. The photo above was Sam being a goofball trying to wear the remnants of his sandwich on his nose. Surprisingly, they did great at the movie too. I enjoyed it much more than I thought I would. And Christopher didn't move an inch the whole time. Sam did really well as long as I plied him with snacks, which I did. I had packed fruit snacks, dried fruit, and some halloween candy (red 40 free, of course) that kept him very happy. He lasted until probably the last 1/2 hour, when he got up and started pacing along the railing, we usually sit in the front upper row, so we have the rail to rest our feet/children upon. Ended up being very handy as Sam paced back and forth between us, he didn't bother anyone, and we were all able to enjoy the movie. Followed by naps for Sam and I when we got home, it was a Good Day. I know, I bet you were thinking of booze. But No. Not for me. However, I'm very happy to show that Saturday Eric got our Christmas tree up and lit! He was able to get out on the roof, and finish the blue lights along the roof, and the invisible blue tree at the front door with star on top. So pretty. I love it. We did get out of the house this evening, to have dinner with my Dad at Brozzini's, love their wings, however they were out of celery, and well, that was just un-American. The drive was enough that I could handle it, just being out in the evening wears me out. It's like the sun goes down, and so must I. But it was so nice to come home to a lovely lit home. We just love the Blue Lights outside, you can see our house from way down the street. I love this time of year. Our Black Friday was spent doing nothing. Yup, that's right, nothing. We watched cartoons. I alternated between sitting and laying down, and my Boyz took very good care of me. Eric brought up the Christmas stuff, getting lights ready, and got on the roof starting to get them on. My little boys made sure I was comfy bringing me a pillow, blanket, stuffie, and then got some for themselves. I made Eric take this pic, because we were all so cozy and comfy I didn't want to forget it. Happy Thanksgiving from the Willmans! This year was extra special, because just in time for the holiday all of were healthy enough to travel to Marion, and cootie free enough to be around Kaylee. Praise the Lord, Kaylee's leukemia is in remission, and her ANC is above 3000, she's able to fight off some infections, not that we are planning on tempting her cootie fighting powers with bringing cooties of our own. The boys were so happy to play with Amber, Alexis, and Kaylee. It did my heart such good. They were loud and crazy, wild and rambunctious. It was Wonderful. I sneaked a peek around the corner before lunch to snap pics and video of them being silly. While the kids were being distracted by each other, I was distracted by the newest member of the Willman Clan, Tula Mae Willman, born Saturday the 17th of November. Isn't she adorable?! I'm a little proud, because she got to wear the Turkey hand Onesie that I made for her at her baby shower. I took a bet that she'd be born before Thanksgiving, a. because Anna and Sean were both big babies, and b. she was due the Saturday after Thanksgiving. So glad it paid off! It was fun to watch everybody hold her. Dollie Beth took first dibs, but as the family matriarch, she won, but others of us waited patiently....or not so patiently. Aunt Katie holding her niece. I told her, Nieces are the Best. Trust me! The boys didn't seem to care much about the baby, they were busy rough housing. Or so it seemed. Kaylee and I had a lot of fun watching all the different birds come to the birdfeeder. We even had a couple different kinds of woodpeckers we saw. I need to put up our See Rock City birdfeeder! I love the look of her just gazing out the window. Anna and sweet Tula Mae. You know, when she's screaming even in a picture she's still adorable. Kaylee was the first youngster to hold Tula, and Tula was so sweet for Kaylee. She's such a sweet baby! All the kids got big kicks out of each other. Chris and Kaylee hold Tula Mae. But when it came time for Chris's turn to hold her, she flipped out a little bit. Of course, Chris was a super champ, he could have handed her right off, he didn't though, he's going to be such a great big brother (AGAIN!) when little baby brother is born. He's so patient, he kept trying to talk and shush the baby down. Even Alexis gave holding the baby a try. Alexis is a Baby Whisperer, and though Tula hushed for a moment, it didn't last, she was too far gone. Sometimes a baby just needs her mama. Yeah, Tula just needed her beatings from her mama. But once she calmed down a bit, I got my turn. These were taken by Katie (or Aunt Betty, not sure which, they were both behind me). Awww...little turtle neck. She smelled so nice. I gotta get me one of these... how about next May?! OK, if you don't like reading about uteruses, and the things that can go wrong with them, please don't continue. I was not feeling well last Tuesday night. The errands of the day, combined with not getting a nap, made me very sore and tired come the end of the day. Plus it was a Bells night, so Eric left me to deal with the boys. They were in crazy form, but I was not in a place to deal with it, and yelling at them left me hurting even more, and at one point, they were both in time out, and I was on the floor crying. By the time, Eric got home, I was still sore, but not crying anymore. Then I went to the bathroom. I was having Spotting. I panicked a bit, and called my doctor. The doc on call told me to drink a lot of water, lay down on my left side, go to bed, (like I was going to be able to sleep) and let her know if the pain got worse. 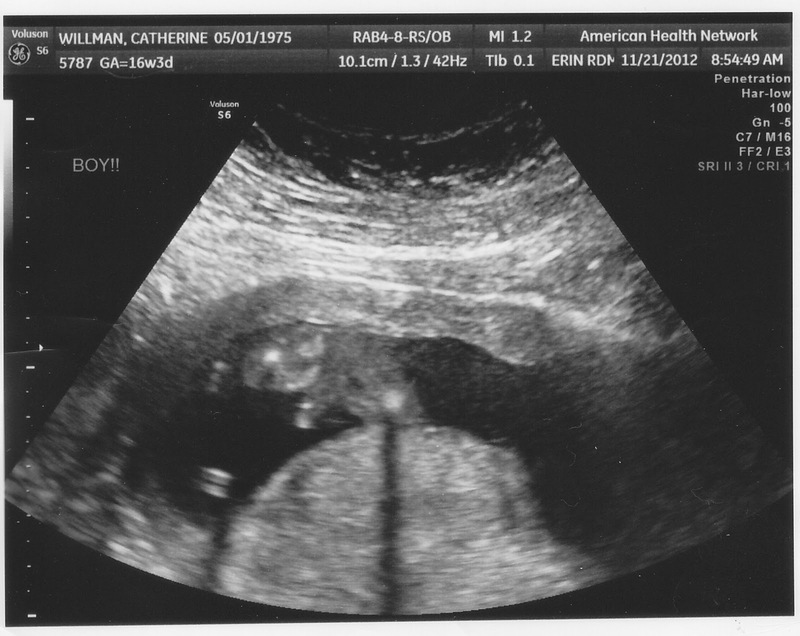 She wanted me to call at 7:30 am to get myself squeezed into the ultrasound schedule in the office. I knew sleep was not going to come to me easily, so I took some Tylenol PM, watched tv and went to bed. Only to wake at 5:30 with really painful cramping. Well, it was sharp enough to wake me from a sound sleep. No more spotting though. But the cramping was keeping me awake. Honestly, it felt like contractions. They were taking my breath away every 10 minutes. I put a call in to the on-call doc, and started calling people to help, but few are awake at that hour. The doc never called back (probably because it was change over) so I called into the office at 7:30, and told them about the cramps They told me to get there as soon as I could. Luckily, I'd gotten a hold of my sister who was going to meet us at the hospital to borrow Sam, and our friends down the street would put Chris on the bus with their son. So off we went. I was nervous. Blood and cramping are just not good. But it was a beautiful morning, foggy, and lovely. Eerie and Awesome at the same time. Kind of like how I was feeling. The 'contractions' seemed to be about 6 minutes. So Lisa met us at the hospital, and we zipped right in, they had me pee in a cup, but that was fine, and then they did the Ultrasound. Immediately, I heard the heartbeat. Praise the Lord! Tears started falling from my eyes. Baby was Fine. Wiggling all over the place, and heart strong at 160. Whew. The baby was so wiggly, they couldn't get a good look at the face, but here's a side shot, the white line is the spine, and the head is on the right, with a white jawbone pointing down. Wiggly legs all over the place. The tech did manage to get a good look at the bottom half, and she spotted this. 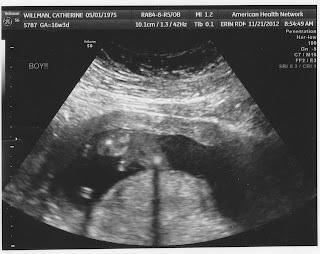 Yes, It's A Boy! But then, she also found some blood floating around. Not a lot, but enough that she called my doc in. Luckily, my OB was in office (the day before a vacation) she's normally in Brownsburg, but we lucked out. 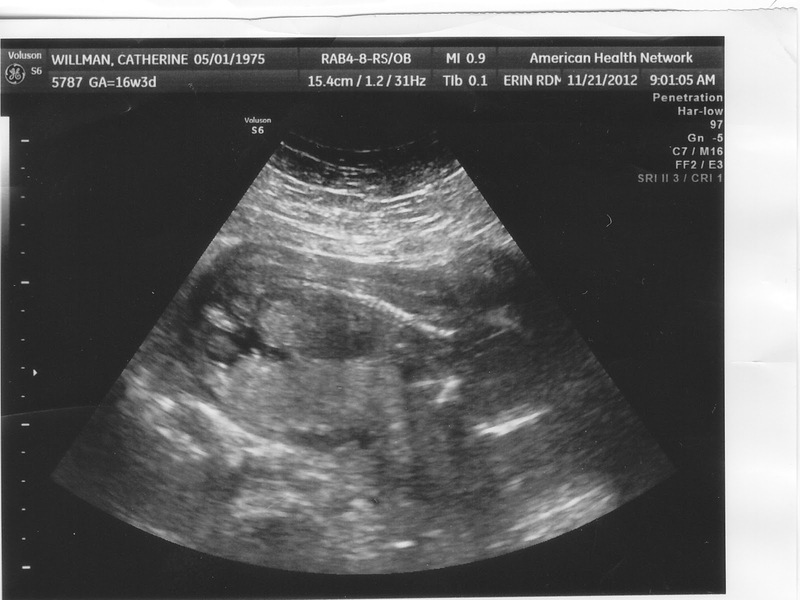 Dr. K took a look at the placenta, the tech thought she saw something. Indeed, there was a small tear. Not a full out placental abruption (those rips end up with a ton of blood and oxygen deprivation/death for the baby). I don't have that. I do have a tiny tear. So she ordered me to take it easy. She said I could sit or lay down. She also noticed I have an Irritable Uterus, which is making me contract. So she said Take It Easy. What about Thanksgiving? I asked. She said I could go to Marion, but I'd have rest while there, take a nap, chill on the couch, make Eric do Everything. All weekend long. We smiled. At least we'd be able to visit our family. And the baby was OK. Suddenly, things were just fine, I just was going to have to take it easy. And we were having another Boy! That actually was a load off too, we've got all the stuff already for a boy, and I know how to take care of them. A Girl, while wonderful, would have been a wild card. Now we'll have 3 boys, our own set. My first thought was of another family at church with 3 boys, and they'd come tearing through the narthex, and we'd all smile, they were adorable and crazy, I turned to Eric, "We're going to be that family, 'Oh there go those Willman Boys.'" Yes, that will be just fine. She probably flip flopped the entire drive to meet us for brunch (Eric and I fed the kids, but didn't eat breakfast ourselves, so once we could Exhale, we were starving.) at Sweet and Savory. Lisa met us there with all the yahoos. And when I showed her the pictures, and that it was a boy, she cried. That was a heartwarming response. Not that I want everyone to cry, but I do, and so do those that get me. The kids were being so cute. Sam and Annie were "Cleaning" Aunt Lisa's arms with sugar packets as soap, and Charlie had asked to 'turl her hair'. Charlie's a twirler, just like Aunt Debbie, and a sweet little thumbsucker like Lisa, she twirled playdoh into her own hair, and Lisa had to cut it off, and give her the cute little pixie haircut. Those girls sure are adorable! I know where they get it. We make cute kids, and I'm mighty Thankful to be making one more. Mom W. had a doctor's appointment last Tuesday morning, and she wanted me to take her. Well, truth be told, I think I wanted to take her just as much as she wanted me too, I wanted there to be someone with her, a. in the event it was painful, so she could take her good drugs, b. to ask a boatload of questions. I had a number of questions, so I told Mom to take the 24 hours prior to document her Q's and we'd ask the doc. That ended up being a good idea, since her list went right in line with what I wanted to know. I got good vibes from her Infectious Disease guy, while they aren't acting fast, they seem to be as concerned with how she's Feeling as we are. They're going to look into putting in a wound vac to aid in healing. Hooray for Proactivity! Plus we got a nice quality time brunch out of it! Anyway, because we were at the doctor's, and Mom was going to get her IV meds, we just didn't think we'd get back up to the Burg to pick up Sam in time for school. So we set it up in advance for him to stay the After Care hours. We got to pack him a lunch, as well as let him choose a stuffy and blankee for him to take. He wanted a turkey sandwich, yogurt, green applesauce (pear sauce), juice AND pretzels. Piglet! And he packed Holly Shiftwell and the Superman Snuggie, that he traded with Christopher for his Seahorse. He was Packed, Happy, and Rearing to go! And he got to stay at Preschool from 9-2:30. Such a Big Boy! He had a wonderful time, and was bummed when I didn't pack him a lunch on Thursday. I took Sam to Kindermusik. He and his friend Blake were the only ones day, they look like twins sometimes, it's hysterical. They are so sweet together. As we're leaving KM class, I called Mom W. She had a procedure on Friday, she's had kind of an absess, and they had to clear it out. She's on IV antibiotics, every day. Ugh. I think my issues are bad. They put in a picc line two weeks ago, and she's been having to drive out to Danville daily to sit there while they plug her in to get her antibiotics. Last Friday, she got roto-rootered. It hurts just thinking about it, but they had to pack the wound with gauze, and now in addition to going and getting her IV antibiotics. She has been taking serious painkillers, she was going to refrain so she could drive out there. After talking to her, I decided to just to let her drug up and Sam and I would take her. It was more conversation than we'd had in months, she's been gone a lot to Florida, and we got caught up, which actually, with the exception of the circumstances, was rather nice. This weekend my husband surprised me. We were talking about what to do this weekend, and where to begin to rearrange things to prepare for #3, when he told me that he had been slowly had been acquiring pieces of closetry for a while. And as it turns out, he had enough to finally do the boys closet, and get the braces in all the other upstairs closets. It was amazing. So to start, he did the boys closet. The boys were happy, thrilled, and they can't wait to get all their stuff inside. I'm pretty excited too. Finishing this closet, means we can empty the dresser that Sam has been using, because it's the changing table too, which means it's like Step 1 to preparing for Baby #3. That's Awesome. Well, with Chris home sick last weekend, our plans got slightly modified. We were supposed to have a Pre-Thanksgiving meal with my Dad, because it looked like Lisa would be leaving this week to get home to her hubs, only she hadn't gotten a car yet, so the plans changed to stay through Thanksgiving weekend. (Hooray! ) So we met at my Dad's. My stepmom makes a wonderful Thanksgiving spread. However...when I got there with Sam (we left Chris at home with Daddy), I learned it was Turkey Pie night! My Favorite ! My stepmom is a wonderful cook, absolutely amazing. Her Thanksgiving foods are legendary, but for me, it's one of my favorites is when she takes the Thanksgiving leftovers and makes a turkey pie. Picture it: Turkey, mashed potatoes, stuffing, peas, all in a homemade pie crust, smothered in gravy, and next to a side of butternut squash. It's a perfect bite every time! As soon as I tasted it, I couldn't help but think, THIS is a every pregnant woman's happy craving. I didn't know, so I didn't take a picture this time, but I have snapped some in the past. I think Eric may have married me because of this pie. Shortly after we began dating, my stepmom sent me back to college with an entire turkey pie just for us. I heated it up for us, and I'm pretty sure Eric fell in love with me right there. Not because he thought I made it, he knew the truth, but maybe he fell in love with me, because I Shared. Anyway, turkey pie night is one of my favorites, I thought we'd be doing that next weekend maybe, so it was a very happy bonus to be getting it Before Thanksgiving. Turns out MB had been cooking one ingredient at a time all week. She did a whole Thanksgiving on Thanksgiving too. But it was Turkey pie night for us. Oh Happy Night. And the kids were cute playing too...for a bit. It didn't last, it rarely does. But for some time, they were sweet. I cherish the sweet times. Chris woke up last Friday with a terrible cough. He was barking like a seal, and breathing like Darth Vader. I took his temp, and he was 99.8, oh yeah, he was staying home. I was pretty sure he had croup. When we went to the doctor's later, even though the Tylenol brought his fever down, Chris was content to sit still and not move around much, while Sam ran around like a nut. Oh yeah, he was sick. Doctor agreed with me it was croup, but he suspected we were on the beginning end of it. It can last 3-7 days, ugh.. He said he sounded like a bit of bronchitis, so he prescribed an antibiotic as well as prednisone. They made Chris feel good enough to get into timeout by dinner time. But his cough still sounded pretty pitiful, and his voice was raw. Poor Pooka. I just hoped he wasn't going to be sick all the way through Thanksgiving, and that we didn't catch it too.